I'm not sure if this is the right section but I found a super awesome website that offers you Market Samurai for 97$ and a 37$ rebate after buying the program. So the total cost for Market Samurai is 60$!. You will need to buy the program through the owner's affiliate link so I'm not sure whether this goes to the referrals section or not (it's not my affiliate link). Anyway, the instructions are on the website (link below). 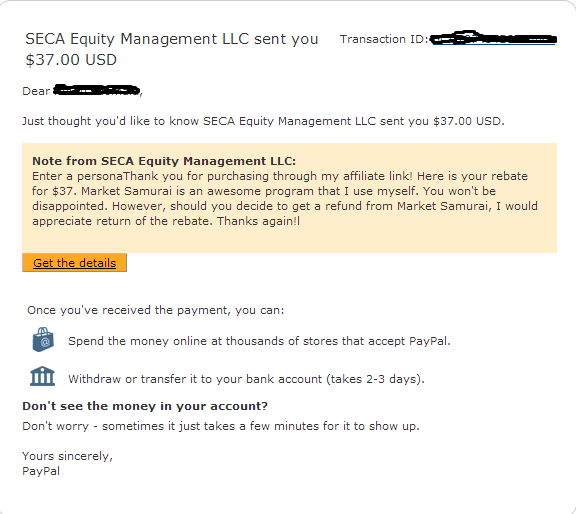 Here's a proof of the rebate that I got in a couple hours after buying the program. OMG! I found this thread on CPAElites when I went to use the search feature and it showed where you can get Market Samurai for free! (2014-02-19, 12:45 PM)Silverdot Wrote: OMG! I found this thread on CPAElites when I went to use the search feature and it showed where you can get Market Samurai for free! Oh damn, I didn't remember to use the search function. I wasted a fortune to buy that program. I agree, it is a little bit temperamental. You can still buy it cheaper elsewhere. I've seen cracked versions that are stable. By the way, WAVE I loved your newbie start kit post. Good stuff. that download link doesnt work. That's a shame. You should ask the poster of that thread for one that does. Or you can use the gmail trick and sign up for a trial and then just move the . and keep signing up for trials. Google and the search button is your friend.